Take heed, the metropolitan liberal elite! Cower, all you Conservative moderates!! Weep, environmentalists, and prepare your online petitions!!! Jacob Rees-Mogg is upon you, a black darkness over the shire, a shade upon your allotments, a frozen shadow upon all your back garden gazebos. And your ancient weapons will not work upon his impervious hide, their keen blades blunt upon the armour of his cruel certainties. 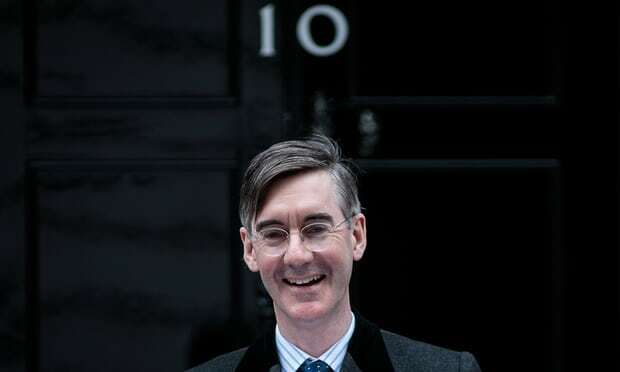 This Rees-Mogg is no Boris Johnson, the blowhard balloon animal who eventually blew himself up, spattering onlookers with a residue of sticky lies. It’s impossible to imagine now that once, only mere months ago, those who would enslave us regarded this gluteus oaf as their strongest asset; this blundering liability, whose greatest supporters now buckle under the heavy arse of his incompetence manifest, even as Johnson himself clings for survival, the cleverest piglet in the flooded farmyard, to the unexpectedly buoyant rubber ring of the suddenly viable Jacob Rees-Mogg. Neither is Rees-Mogg a Gove, that cunning twig, nursing ambition beyond the scope of his tiny wooden body, buffeted by the river currents, hoping to drift towards the distant shore of victory, and blown along the surface by the storm breath of his giantess troll. These two – the tiny twig and his fair-weather friend, the burst balloon animal and swimming pig – may yet be remembered as nothing more than the twin mini-Ikea stepladders upon which Rees-Mogg raised himself as he reached up toward the blown 40-watt lightbulb of Tory leadership. Journalists and wits! TV panel show satirists!! And all the historic enablers of Have I Got News For You, unwitting celebrity engineers of the Boris Johnson golem!!! To rankle Rees-Mogg you need a charm word even more powerful than John Crace’s “Maybot”, which damned an already doomed leader in two conjoined syllables. But you have nothing. Your arrows of satire are blunt before him and your broken spears sleep in your hands, clawed uselessly into the shape of decades of lunchtime pints. You call Rees-Mogg “the honourable member for the 18th century” and Rees-Mogg ingests the insult and owns it; he takes it as the highest compliment and it makes him stronger. He is an Etonian Hedorah, from Godzilla vs Hedorah (1971), the monstrous tadpole that increases in size as it feeds on pollutants, emissions and waste. He is Stan Lee’s Absorbing Man and even the Norse gods are no match for him. Rees-Mogg acts as if all his political positions are the result of nothing but quiet contemplation of the facts, with no visible emotions to betray the idea that they may be anything other than totally objective. You cannot hurt his feelings. He admits to none. You may as well stand in an aquarium hurling insults at an eel or swear at a chutney. Long ago, in my capacity as Britain’s most consistently critically acclaimed standup comedian, I learned to treat all heckles, however aggressive, as if they were genuine inquiries made by people who were not fortunate enough to have recognised my genius. Rees-Mogg affects to regard all outbursts of noisy protest as the babbling of people sadly too foolish to realise that he is right, appearing to pity those who hate him for their lack of understanding. It may be that he is doing this consciously. Or it may be that the machine of privilege and entitlement that has fashioned Rees-Mogg has done its work so well it is simply impossible for him to believe otherwise. Either way, it’s an impregnable strategy. “The honourable member for the 18th century!” You will have to do better than that. For Rees-Mogg is upon us, his cold breath on our heels. Eventually, as Boris Johnson has shown us, even a public raised on Britain’s Got Talent and tomato sauce-flavoured crisps tires of empty novelty and the allure of Rees-Mogg will fade. But by that time, what damage may already have been done? The annals of the fantastic are filled with portals, gateways to parallel dimensions of evil that, once unlocked, can prove difficult to seal. In Arthur Machen’s The Hill of Dreams (1907), young Lucian cannot stop up the opening to the pagan past; in Hideo Nakata’s Ring (1998), a television screen doorway allows murderous ghosts into our realm; in modern Britain, it has been the Elizabethan court sorcerer’s black mirror of Brexit that has enabled once unimaginable atrocities to make their way into mainstream politics; Farage; Gove; Johnson; and finally, Rees-Mogg. The Lord of the Ring, by J R R R Tolkings, is understood to have been informed by J R R R’s first world war experiences. Doubtless the increasingly disoriented Vote Leave founder Dan Hannanannanannan could twist it into a workable fable for the success of Brexit, as he does with everything, except Brexit itself, upon which matter he is gradually growing ever more silent. Behold! The plucky gnomes of Tolkings’s shire are shedding the yoke of Euro-mancy. But Tolkings’s folkloric hybrid seems perfect for Remainers too. When my anarchist and communist friends voted, sincerely, for Brexit, the last strand of our disagreement still standing was the evidence that Brexit would create a bridgehead for the far right, demons entering this plane from previously distant dimensions, and it has. Put on the magic ring and you can see them coming. But as all around us crumbles, a plucky band of little folk nonetheless stands firm against the wraiths of the government’s far right. Old Bilbo Ken Clarke Baggins, upon the road to Rivendell with Sonny Rollins’s Freedom Suite bopping on his Walkman; little Frodo Soubry, stepping forward in grim determination with her loyal follower, tiny Samwise Greening; all under the guidance of Lord Gandalf Adonis and the protection of ancient Treebeard Heseltine, a speaking and often incoherent tree of indeterminate vintage. This brave band sets off to save the Tory party and, by association, the nation, from itself.